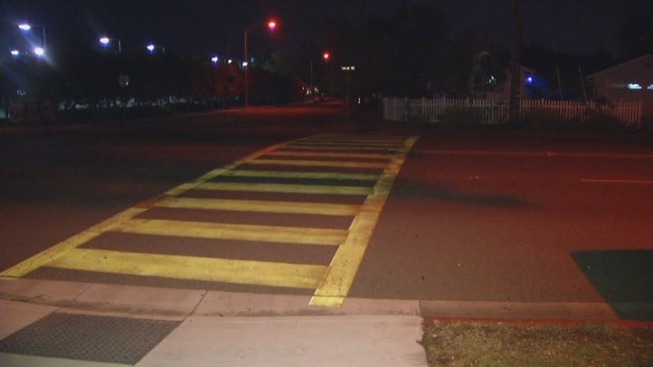 San Jose police say a 27-year-old man was arrested Tuesday in connection to a hit-and-run near Lietz Elementary School. Lietz Principal Larry Thomas said in an e-mail to parents that a 5th-grade student was injured in the collision while crossing in the crosswalk at Kooser Road and Carter Avenue, which is near the campus. Sean Amaro witnessed the incident. "The little boy wasn't moving for a while. He was bleeding from his forehead," Amaro said. "My wife was out here trying to keep the kid calm." The incident happened around 8 a.m.
"Emergency services responded, and the student was transported to the hospital," Thomas wrote in the e-mail sent out to parents and the school community. "The student’s parent was with the student in the ambulance and reported that the student was conscious." Officials said the boy suffered a broken ankle and is expected to make a full recovery. "The students is in good spirits and is likely to be released this evening," Thomas said in a follow-up e-mail. Police were able to make the arrest with help from a witness and an alert parent. The witness reported seeing a blue and white Smart car involved in the hit-and-run collision. The description of the vehicle was included in Thomas' e-mail. A parent reading the message contacted police to alert them of someone she knew that drove the vehicle described in the incident. Police said the man arrested lives in the area where the hit-and-run occurred. The arrest of the suspect is good news for a community that has been frustrated with reckless driving on a busy road. "Me and my wife were actually talking about getting a petition or doing something about the street, especially at night," Amaro said. "I hear people all the time going through the road like it's a freeway."